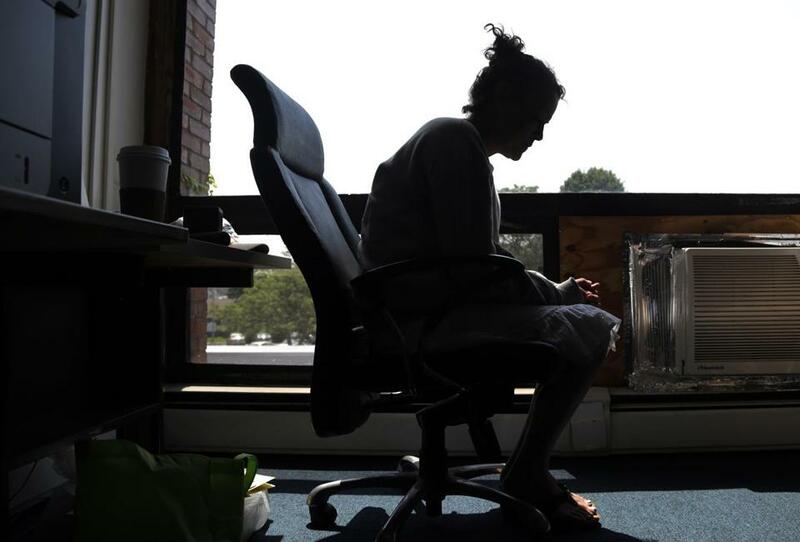 A woman inside the police station in Gloucester, Mass. She voluntarily came to the police for help kicking her heroin addiction. BOSTON (AP) — A novel drug addiction program developed in a small Massachusetts fishing town and since replicated in dozens of cities nationwide was able to place almost 400 addicts into treatment nearly each time they sought it during the first year of operation, researchers say in a report being published Thursday in the New England Journal of Medicine. The team from the Boston Medical Center and Boston University’s School of Public Health say 376 addicts sought assistance 429 times from the Gloucester Police Department’s Angel program from June 2015 to May 2016. They received the help they needed nearly 95 percent of the time, researchers say. Davida Schiff, a Boston Medical Center doctor and lead author of the report, said that rate is far higher than the 50 to 60 percent for similar, hospital-based initiatives. Part of the reason, she said, is that Gloucester’s addicts were voluntarily coming to police seeking help. ‘‘They were motivated individuals that came to the station ready to engage in care,’’ Schiff said. The report also notes that Gloucester police established a relationship with a local treatment center to make placement easier. Its officers were working round-the-clock to secure the placements. And Massachusetts mandates health coverage for drug detoxification. Law enforcement officials in communities that have adopted Gloucester-like heroin initiatives say the report helps validate their work. ‘‘Police officers do not get to pick and choose who they help, and that puts us in a position to make a major impact on the heroin and opioid epidemic,’’ said Frederick Ryan, police chief in the Boston suburb of Arlington. The Angel program has been replicated in some form by more than 150 police departments in 28 states since it was launched in June 2015. It gained notoriety after the then-police chief promised heroin addicts they could turn in their drugs at the police station without fear of arrest, so long as they agreed to start treatment. As part of the program, officers personally reach out to treatment centers on behalf of addicts, arrange their transportation to the facilities and, if needed, pair them with a volunteer ‘‘angel’’ for emotional support. David Rosenbloom, a professor at Boston University’s School of Public Health who helped write the report, suggested the program’s success underscores the difficulty of accessing drug treatment services. Roughly half of the participants in the program had prior drug-related arrests, he noted. The next step for researchers is following up with first-year participants to see how they fared in treatment and beyond, he said. The researchers also hope to study similar programs nationally.